In 2015, we introduced a newly designed Employee Engagement Survey to find out what we can collectively improve to live the spirit of our People Strategy. We ran the survey for the second time in May 2016, with a response rate of 86% (1% up from last year) with close to 20 000 written comments. Our overall engagement score increased 9 points from 58% to 67%, putting us well above the Global Financial/Insurance Average benchmark of 61% and close to the Global High Performance benchmark of 71%. We progressed significantly in the improvement areas we identified in the 2015 survey: Improve job rotation opportunities and opportunities across geographies, increase transparency around rewards and focus on retaining key talent – all went up 10–14%. Now our aim is to meet or exceed the high performance norm by retaining the gains we have achieved and continuing our progress in priority areas. In 2016, we were recognised by our engagement survey providers AON Hewitt as a Best Employer in several countries and the whole Europe region. In terms of our key strengths, 82% of surveyed employees feel that Swiss Re values diversity and has an open, inclusive culture. All questions about manager effectiveness are above or close to the high performance benchmark and 80% of participants agree that they are given the flexibility to balance work and personal life. Finally, 76% agree that their job is a good fit, and 71% feel a strong sense of accomplishment in their work. Our engagement survey provider Aon Hewitt (www.aon.com) has a well-established and globally recognised Best Employer programme. This measures employer excellence worldwide by analysing survey results and benchmarking them against their other client companies. In 2016 Swiss Re was recognised as Aon Best Employer in nine out of 17 eligible countries: Australia, France, Germany, Italy, Japan, Mexico, Slovakia, South Africa and Switzerland. 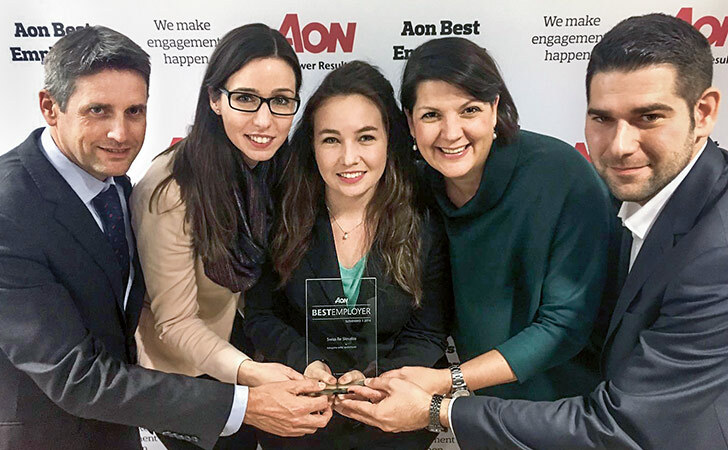 In addition, the overall region Europe has qualified for the Aon Best Employer regional recognition.